My sister unearthed this relic while packing for her upcoming move and it completely makes me smile. I hope Oscar has as much fun growing up as I did. 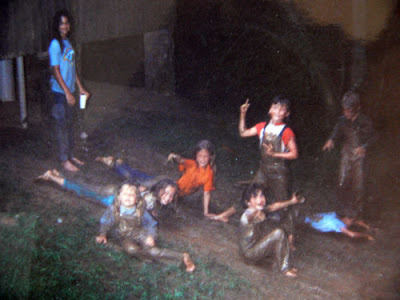 That’s me in the orange shirt, completely covered in mud and sliding headfirst down the slide I made with my friends one summer in the mountains. I am pretty sure I had to take like 3 baths to get it all off. What’s even better is that only 2 of the people in this picture are boys. Tomboys unite! Who needs counseling when you can buy crayons for $1.70?